Spot silver bounced back sharply on Friday to close the silver trading session as a wide spread up candle and marginally below the $18 per ounce level once again. This positive tone carried the industrial metal back above both the 9 and 14 day moving averages but failed to breach the 40 day moving average which waits above. However, this bullish momentum has carried through in this morning’s early silver trading session with spot silver now testing this technical indicator at time of writing. 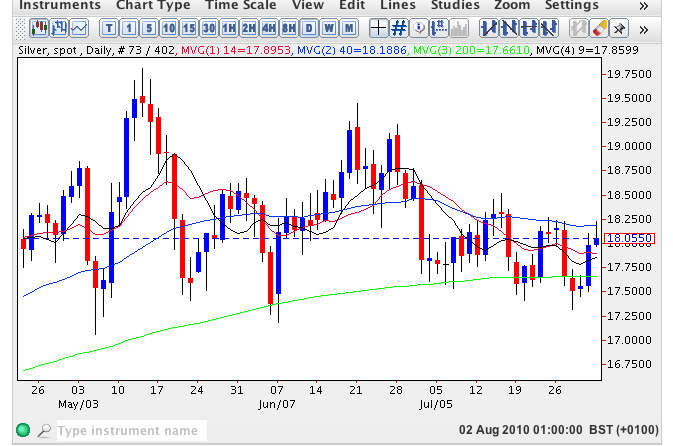 Any break and hold above the $18.51 price point should see the spot silver price climb further and once clear, the price congestion below should provide a solid platform of support for spot silver to re-test the recent highs once again, initially at $19.33 and subsequently $19.81, the high of May 2010.